Since the war, a significant increase in the population of Vietnam has contributed to inequalities in access to services. In addition, the country has experienced many natural disasters. Between earthquakes, floods, and tsunamis, Vietnam has often had trouble recovering from successive crises that serve only to exacerbate poverty. 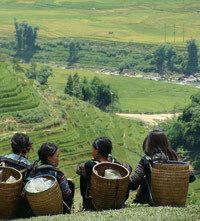 Over the last 20 years, Vietnam has made considerable progress in fighting poverty. However, these improvements have yet to reach the marginalized populations who live in remote regions such as the mountains of the north, the central highlands and the areas surrounding the Mekong Delta. Vietnam is currently experiencing a large increase in population, with the result that more and more people are seeking healthcare services. In 2008, only 42% of the population had healthcare coverage. Today, coverage is free, in theory, for all children under the age of 6, but in practice, access to services is still quite variable. Furthermore, even though notable progress has been made, existing hospital infrastructure and medical personnel are not sufficient to accommodate and attend to everyone in need. For example, in Ho Chi Minh City, the economic center of Vietnam, there are only 8.2 doctors for every 10,000 residents. Lastly, the healthcare sector in Vietnam is largely subsidized by international organizations. In Vietnam, significant progress has been achieved in providing all children with access to education. Elementary school is officially free and is attended by more than 96% of children ages 6 to 11. The high school attendance rate, however, is markedly lower, and university tuition is far too expensive for many Vietnamese. Estimated at more than 960 American dollars per year, a university education is inaccessible to poor families who earn, on average, only 240 American dollars per year. Although prostitution is illegal, it has become more and more rampant on the streets of large Vietnamese cities. Child prostitution is continuously growing. 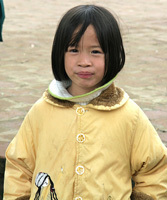 Today, there are approximately 40,000 child prostitutes in Vietnam, who earn on average 10 dollars per encounter. These children work in grocery stores or restaurants during the day, then afterwards are sent out by the owners of these establishments to work as prostitutes. Frequently the business of prostitution extends beyond the borders of the country. Many children are victims of trafficking and are sent to different countries to be sexually exploited. 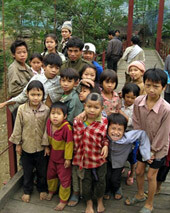 In Cambodia, for example, a third of all prostituted children come from Vietnam. According to estimates, more than 65,000 children roam the streets of the major cities of Vietnam, including 7,600 in the capital and more than 18,800 in Ho Chi Minh City. This phenomenon has not escaped the notice of the authorities, who try to hide the troubling reality during large public events by rounding up these street children and holding them in social centers for the duration of the event. Numerous campaigns of arrests have evidently been carried out by authorities in recent years, and many children have experienced ill-treatment over the course of their arrest and confinement. More than 16% of children aged 5 to 14 work. Legally, the minimum age to work is 15 (18 for dangerous jobs), but there are exceptions for certain types of work such as traditional sports and artistic activities. Some children work in traditional craft villages, seasonal businesses, and doing restoration work. Despite being legal, the working conditions at many of these jobs is inappropriate for children, with long hours and very taxing work. Most children who work are recruited for illegal labor such as prostitution, soliciting, or selling drugs and other illicit materials. 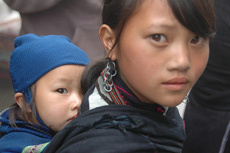 In Vietnam, 12% of children are not registered at birth. Some unmarried women do not register their child out of shame, or wrongly believe that children born out of wedlock cannot be registered. Somewhat less than half of families fail to register their child within the legal time limit. The Vietnamese authorities abolished the penalties for registering late and extended the deadlines in an effort to decrease the number of stateless children. Currently, the deadline is set at one month from birth in the plains regions and two months in the remote regions and the high mountainous plateaus. 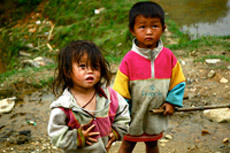 The minorities who live in the mountains and in conditions of extreme poverty have little access to education, firstly because they live too far from schools and secondly because the language of instruction is Vietnamese, a language they do not speak. Also, their parents often are not aware of the importance of education and health.